AMD is a chronic condition affecting the central macula that can cause a progressive loss of central vision. Age is a risk factor for macular degeneration, with people aged 50 and over most frequently affected. However, AMD is not a normal or certain part of ageing. “The results were more significant for those participants who developed the ‘wet’* form of late AMD. The potential protective properties of eggs are in the carotenoids contained in the yolk, particularly lutein and zeaxanthin, which have anti-inflammatory and antioxidant properties. There is evidence that these macular carotenoids could have a beneficial effect on the progression of AMD. Associate Professor Gopinath says dark-green leafy vegetables are established as being good sources of carotenoids, particularly lutein and zeaxanthin. Therefore, all people with AMD, regardless of disease stage, are encouraged to increase their intake of dark green leafy vegetables as part of their regular diet. AMD was determined from retinal photographs. Egg consumption was assessed using a semi-quantitative food-frequency questionnaire. Total egg intake was calculated through summing up intakes in all forms e.g. boiled, poached, fried, scrambled and/or omelette. Researchers summarized total egg consumption into the following categories: =1 egg/week; 2–4 eggs/week; 5–6 eggs/week; and =1 egg/day. 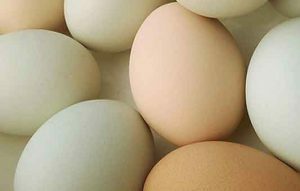 Participants who consumed 2–4 eggs/week versus =1 egg/week at baseline had 62% reduced risk of developing neovascular AMD. Among those whose AMD onset was at or before the 10-year follow-up, consumption of 2–4 and 5–6 eggs/week was associated with 54% and 65% reduced risk of incident late AMD, respectively. * Late AMD is when vision becomes impaired. Late AMD can be classified asdry (atrophic) macular degeneration or wet (neovascular) macular degeneration.